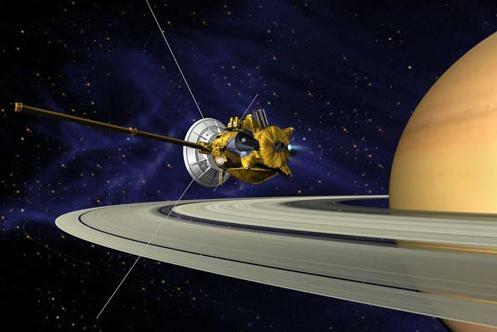 The Cassini spacecraft, orbiting Saturn since 2014, will end its mission with 20 orbits to fly just inside the D ring beginning April 2017. Cassini has already started (from December 2015) to decrease its periapsis closer to the G & F rings and increase the inclination of the orbit. The Swedish Institute for Space Physics in Uppsala is responsible for the operation and data analysis of an instrument, a Langmuir probe, on board Cassini. The examination project concerns the analysis of data from this instrument. Use the up to date the Langmuir Probe data set to obtain the electron density near the rings of Saturn. Especially the many of recent Cassini orbits go further inside the moon Enceladus orbital distances. Enceladus was believed to be a major plasma source of the Kronian magnetosphere, however, recent studies suggest that the inner rings are also important and the dynamics are highly variable. The obtained plasma densities will be correlated with the coordinate system of Saturn magnetosphere as well as the ring and moons orbital locations to characterise the plasma sources. Cassini will continue decreasing the distances from Saturn and planed to cross the F ring in 2017. An empirical plasma density model will be made in the end of the project and will be used as a prediction of the future coming Cassini F ring observation. If necessary the other plasma parameters, like the electron densities with different measurement, ion densities, and magnetic field will be correlated to enhance the plasma dynamics theory.